The LG G7 ThinQ is the company’s best-looking phone yet. Complete with an all-glass design and nearly no bezels, it’s got all of the makings of a winner. We’re currently conducting tests of our own, and will be updating this article with only the very best cases available on the market. But in the meantime, these cases below (while untested) look to be wise investments based on their design, robustness and overall value. Most people are conflicted on buying a case. Understandably so, as you’re essentially masking the purchase that you’ve made. If you’re one of those people, the silicone case from TopAce might be the best option for you, and it won’t cost a lot. 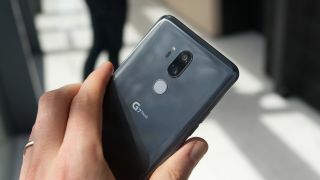 This one slips around the G7 ThinQ’s curves easily, fitting close to its all-glass design and the clicky metal buttons. With this option on your phone, say goodbye to deep scratches and potential cracks if you drop it or grind your keys across the back. For its low cost, it’s more than worth the price of entry if you think you’ll put LG’s new phone through some abuse. LG’s new G7 ThinQ comes in a few different colors, but why limit yourself to just those three? Aeska has a fleet of flexible cases out for a low price that are sure to spice things up a bit. Mint, smoke black, clear and purple make up the company’s offering. While not the most durable case on the market, this one allows for easy access to all of the phone’s ports and buttons. It also has a dotted pattern on the inside so that the case doesn’t stick right to the phone and create air bubbles. Preserving the design of a phone is important to a lot of people, even moreso when you’re looking for a case to protect it. The Ringke scratch-resistant case comes in a few colors, unlike the above silicone case, and looks to suit those who are reluctant to adorn protection for their new LG phone. Aside from the expected features, like easy access to buttons and ports, the one has an added groove near the fingerprint sensor to clue you into where it is, so you can find it without trying too hard. Sometimes, function is more important than form. If you’re someone who puts their tech through its paces, you know what we’re talking about. Ringke’s durable case for the G7 ThinQ embodies that with its rugged build, covering the phone’s every angle. This Fusion-X is considerably cheaper than other hearty options, and comes in a few different colors, too. The G7 ThinQ is already tough with its military grade certification, but this case doubles the protection with MIL-STD toughness of its own. If you’re looking for multi-layered protection and a bit of extra functionality as well, consider Spigen’s Tough Armor case. It’s relatively affordable and does something that the others cannot: act as a kickstand. Popping it out works perfectly, whether you’re at home eating a meal or on a plane or train. Beyond its more obvious uses for multimedia, this is a tough case that protects the G7 ThinQ from every angle. This case from Otterbox offers the ultimate level of protection found on our list thus far, protecting the G7 ThinQ from just about every angle. Available in all-black or in a magenta and grey color combo, this rugged case doesn’t detract too much from the sleek design on LG’s notch-equipped smartphone. Compared to other cases on this list, this is the most drop-friendly, yet it offers easy access to the ports, and the rubber button extenders are nice and clicky.